TPMS is an acronym for the Tire Pressure Monitor Sensor from Garmin. This is a nice feature offered by Garmin as an optional accessory to many of the latest Zumo motorcycle GPS models. We’re going to discuss what it does and how it integrates into a Garmin Zumo motorcycle GPS. The Tire Pressure Monitor Sensor is a smart valve cap. There are integrated sensors and a battery. The sensors not only check the tire pressure but even detects motion. The motion sensor helps to preserve battery life. When you turn off your Garmin Zumo, the TPMS enters low power mode. They wake up again when you start moving and might take up to 30 seconds to wake up and reconnect to the paired Zumo. This contributes to a reasonable battery life that approaches 18 months. Not too bad. The Garmin TPMS system uses replaceable BR1225 batteries. These are inexpensive and easy to replace. Select a reputable brand such as the Panasonic BR1225 Batteries. Each tire has a unique valve cap with an integrated TPMS. The Tire Pressure Monitor Sensor speaks to a Garmin Zumo GPS using ANT which is a communication protocol similar to Bluetooth. 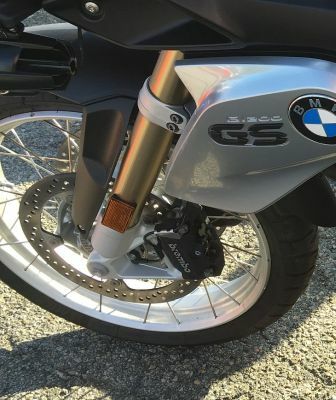 Just like your phone, the TPMS must pair with the Garmin Zumo motorcycle GPS prior to use. Just like your phone, once the TPMS is paired with your Zumo, it stays paired. The setup is done through the Apps selection then Tire Pressure on a Garmin Zumo GPS. When pairing, your Garmin Zumo will ask which tire you are about to pair. Pairing is done with the TPMS close to the Garmin Zumo so don’t attach these to your tires just yet. Follow the instructions from Garmin. Setup is fast and similar to connecting a smartphone to any Bluetooth system. Numerical stickers are included with each cap. Paste these on after pairing so that you know where each one belongs. You can use up to four of these at a time. They aren’t made for use on a car, just motorcycles, so most will only need two of these. Similar to the tire pressure monitor on most automobiles, the Garmin Tire Pressure Monitor Sensor lets you know the current pressure readings for each tire. The pressure is measured in PSI. The Garmin Zumo display shows a silhouette of a motorcycle and each tire’s individual pressure reading is displayed. Set custom pressure thresholds and if tire pressure changes, an alert is received on your GPS. You can also measure tire pressure trends over a period of time. This enables detection of a slow leak so that you can proactively take care of the problem before it becomes a bigger problem. That’s something that you can’t do on a car. You might be all fired up and ready to run out and buy a few of these. First, make sure that your GPS support TPMS. As of this writing, this capability is present on Garmin Zumo models made over the past several years. Currently this includes the following models: Garmin Zumo 390LM, Garmin Zumo 395LM, Garmin Zumo 590LM, Garmin Zumo 595LM.